You have 2931 characters. Don’t forget to add important and relevant keywords in your description to improve your iTunes app page and optimize your SEO. Your app's last version was released on December 20, 2011. It is important to regularly update your app. Best practices recommend to update your app every 4 to 6 weeks. This means fixing reported bugs, improving existing features, launching new features etc. Keep an eye on users' feedback. The next great features may already be asked by many users. 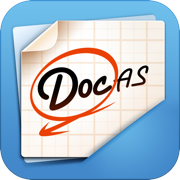 DocAS is a world-class productivity and business App for your iPad. It is a powerful tool for reading documents, annotating PDF, taking notes, doing presentation, recoding, printing…etc. * Sketch your ideas * Annotate your PDF * Show your presentations * Read your files * Record your classes or meetings * Share your notes...etc.